LAST MINUTE SAVINGS:Any Reserved Days Within 5 Days of Booking Date Will Be Discounted 30%; 6 to 10 Days = 20%; 11 to 15 Days = 10% Our Online Rates Are Changed Daily To Include These Discounts. This is one of "The Best Little Condos In Daytona". Unit 214 at Harbour Beach Resort has a very unique floor plan with a queen size hidden wall bed that allows the living room to be converted to a private 2nd bedroom in the evening. During the day, A large picture window allows a full view of the ocean from the Bar, Kitchen and Dining Room. In the evening, there are blinds for this window to provide privacy. This unit features spectacular Direct Ocean Views from the Bedroom, Living Room/Bedroom 2, Kitchen and Dining Room! This NE corner corner unit allows a panoramic North, East and South view from the balcony. The condominium complex adjoins an Oceanfront Park with Covered Picnic Tables, Cook-out Facilities and Children's Play Area. Harbour Beach Resort underwent a multi-million dollar restoration which was completed in 2010. In addition to the cosmetic improvements, the complex replaced all of the balconies, railings, glass sliding doors, windows and air conditioners. Unit 214's complete restoration was just completed in October, 2013. Included in the restoration was New Wainscot Wallpaper with Chair Rail moulding, New South Sea Rattan Furniture and New Verticals and Blinds. New "Cottage Style" Kitchen Cabinets as well as a New Built-in Oven and Smooth Cook Top, Full Size Refrigerator, Under Cabinet Microwave and Glass Mosaic Backsplash. I am a lifetime Florida resident. I began purchasing, totally renovating, and managing Daytona Beach vacation rentals in 2001. I currently have 6 of the nicest Vacation Rentals in Daytona. My business is known as 'The Best Little Condos in Daytona'. All of my units have 5 star ratings with VacationRentals, HomeAway and VRBO. It is my desire to provide you with the best possible experience when vacationing with us. Great place...wonderful host...perfect sunrise views! We had a wonderful stay and loved the unit! The location was great for watching a daily sunrise...spotting dolphins in the ocean...and taking a daily walk on the beach. The pool was great and everyone at the property was super friendly and helpful. The price was right and we would definitely go back. The ease of walking on the beach to get to many options for afternoon cocktails and food was fantastic! We had a great stay! The condo was clean and had everything we needed. 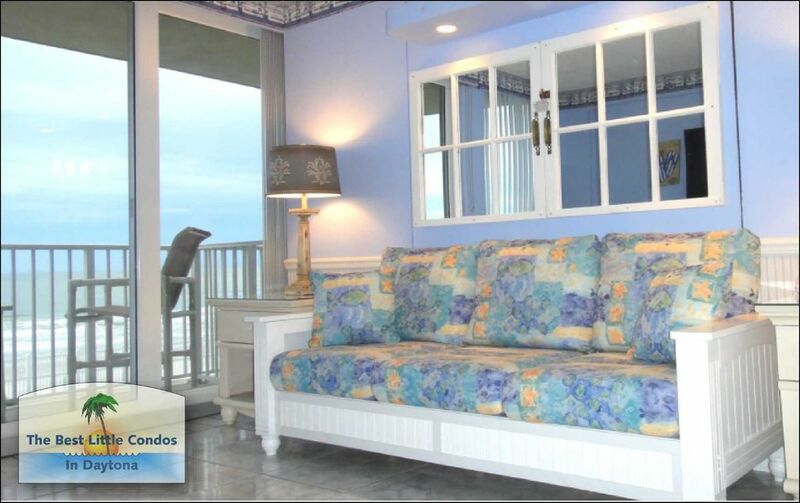 The condo is right off the beach and walking distance to the boardwalk and many restaurants. The pool was nice and clean for the times we used it when the water was too rough and cold to get in. Would definitely recommend to others. Cute place super close to everything! Cute place perfect for 2 or 4 guests, and very close to Main Street. End unit, quiet with good views and very clean. Security and Parking attendants were always available to help, but laid back atmosphere. Would definitely rent again. Loved everything about the property! Great pool, hot tub, and beach access. Game room with free ping pong downstairs. Great location on the beach. Restaurants a very short walk down the beach and boardwalk and shopping is close. The unit itself has an excellent setup and had everything we needed! Great centralized location. Condo was clean and very roomy. Great ocean views.